I am a product of the quality movement of the Eighties. 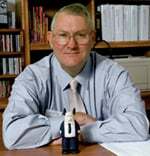 I was a Deming Disciple and in the Nineties was a Baldrige-trained examiner for the State of Georgia’s Board of Examiners for their state quality award. I have taught courses on quality management in both Schools of Education and Business. I still believe that one of the best ways a school or department can assess itself is to download the latest Baldrige Criteria and examine their own processes and results based on the questions and metrics noted in the seven different criteria. All that is background to suggest that my ears perked up when my colleague Jeff Nugent suggested that I look at metrics associated with the scholarship of blogging as part of my goals for the next academic year. So I started looking around. I found that there are many anecdotal pieces written in both blogs and journals that suggest that many in the edublogosphere view what they do as scholarship, but not many true SoTL-class research studies on blogging. (If you know of some, please place a link in the comments below!) This suggests that the timing is good to explore suitable metrics that could measure the value of a blog posting in terms of its scholarship, potentially allowing its use in promotion and tenure decisions. Michael Jensen, in a Chronicle of Higher Education article entitled “The New Metrics of Scholarly Authority,” noted that most current metrics of scholarship are associated with the old model of information scarcity when thanks to the Internet and Web 2.0, we now live in an age of abundance. Peer-review potentially takes on a new meaning in a “hive mind” or “wisdom of the crowds” environment. Jensen noted that in Wikipedia, the more an article is edited, the more authority is is deemed to have. He also suggested that machine intelligence will begin to sort material on a variety of metrics, including raw links, valued links from others in authority, commenters, nature of comments, tags, and an assortment of subjective values associated with who one is, where one works, and who one associates with. Jensen suggested that it make take 10 to 15 years for these metrics to take hold, but that they are coming. 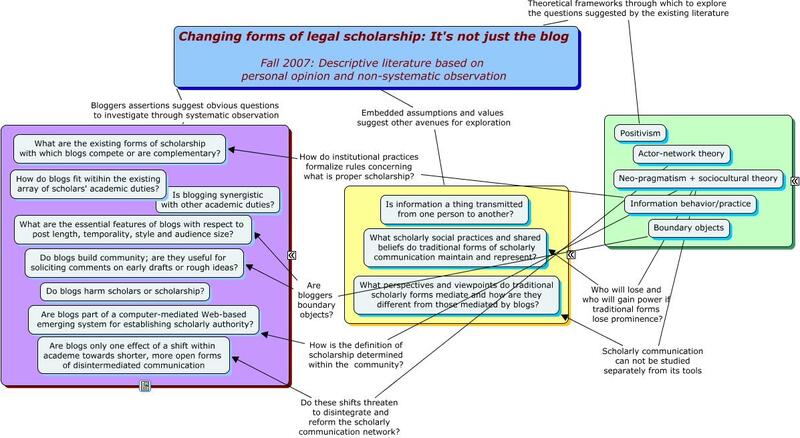 I also stumbled across a work in progress by Georgia Harper, who contemplated writing her dissertation on whether legal blogs are a form of scholarly communication. In a series of six blog posts, she detailed her development of her research project on blogs as scholarship. I recommend the whole series, but found fascinating her concept map below and linked here. – What are the existing forms of scholarship with which blogs compete or are complementary? – How do blogs fit in the existing array of scholar’s academic duties? – Is blogging synergistic with other academic duties? – What are the essential features of blogs with respect to post length, temporality, style, and audience size? – Do blogs build community? – Are blogs useful in soliciting comments on early drafts or rough ideas? – Do blogs harm scholarship or scholars? – Are blogs part of an emerging web-based system for establishing scholarly authority? – Are blogs only one part in a shift within academia towards shorter, more open forms of disintermediated communication? – What perspectives and viewpoints do current forms of scholarship mediate, and are they different from those mediated by blogs? Great questions – and a baseline from which one could develop metrics. So what do you think? Is this worth doing? I would love to hear your thoughts and comments as I begin work on crafting a model of blog metrics associated with scholarship.